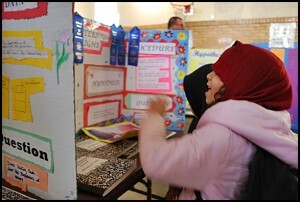 It’s science fair season for the Hamtramck Public Schools, and you know what that means. Yes, plenty of studies involving, cheese, mold, batteries, water and paper airplanes. Over at Holbrook Elementary School, the students had the full range of science fair displays, and really, it was a pretty impressive sight. Did you know that sometimes one plus one does not always equal two? We’re not sure how that works out mathematically, but it has something to do with sugar displacing water. But no matter how you add it up, a science fair at Holbrook equals plenty of fun.